(You may download a PDF of the complete translation here: Genesis 2-3: The Story of Adam and Eve). The second creation story, or more commonly, the story of Adam and Eve and the Garden of Eden (or, more simply, the Garden story, the story of Adam and Eve) is very different from the first creation story. Where the majesty of divine creativity is described as creating order from chaos, God (Elohim) was its focus and the creation of mankind its pinnacle. Each day of creation is described as a God-mediated creation event culminating in five judgments of “good” and one of “very good”. The Garden story is much different. Right away we get a sense of the change in perspective when, in its first verse (Genesis 2:4), the phrase heaven and earth is reversed. Now read as earth and heaven, the divine author signals an elevation of terrestrial matters. Another change in perspective is signaled when the name of God changes from Elohim (God) in Genesis 1 to Adonai Elohim (the LORD God) in the Garden story. In Genesis 1 Elohim was transcendent, otherworldly, wholly majestic — a distant creator standing astride His creation who creates by word and thought. By contrast, the author of the Garden story characterizes Adonai Elohim as an involved creator, who creates by deed — often analogized as a potter shaping a piece of clay1)Even the verbs used are different. In the first creation story, the verb for divine creation, bara, is used to describe how God creates mankind (and selected other created things). In Genesis 2 the verb yitzar (meaning to shape, form, or sculpt) is used. Where bara is verb whose only subject is God, yitzar is a verb used by both God and His creations.. Probably the most significant, and theologically important difference between the two stories is how the nature of the relation between God and mankind is revealed. In the first story, mankind is created to be God’s vice-regent. Imbued with the image of God, mankind is to rule in His stead. In the Garden story that all changes. The notion that mankind has responsibility for the earth is still there (in Eden, he’s a cultivator of sorts), but the climax of the Garden story is not about the creation of mankind. It is about mankind’s loss of immortality and the accompanying separation from God. Having chosen mortality over eternal life, Adam and Eve are no longer fit to inhabit Eden and are expelled. Contained within the two chapters (Genesis 2 and 3) of the second creation story is the answer to a profoundly fundamental question: what is the nature of evil? The answer provided in the Garden story contradicts the pagan conception of evil. In pagan theologies, even its gods committed evil deeds. By contrast, in the Garden story evil is dissociated from the created order and is not inherent in nature. The author, under divine inspiration, removes evil from the physical world and places it in the metaphysical, moral order. Evil is what men do, not what the gods or nature causes them to do. The pagans of the surrounding cultures, upon hearing this story, would have been shocked and possibly angry. The Garden story, like the first creation story, demythologizes the pagan gods. Evil is not the result of capricious gods. The human is the moral agent and evil is the result of choice, not nature’s dictates. In this, the Garden story stood as a radical polemic against the existing (and historical) pagan beliefs that evil was part of nature. Underlying all of Judeo-Christian moral theology is the notion, first expressed in both first and second creation stories, that nature is not a moral actor. Mankind has only itself to blame for evil in the world. In all of the Bible’s narratives evil is always a consequence of human endeavor. The consequences of the exercise of free will in ways counter to God’s words – whether they be His commands, warnings, or instructions – are metaphorically represented as causing separation from God (expulsion from Eden). As will be clarified in the verse-by-verse commentary that follows, the existence of free will leads to the consequent agony of choosing between competing temptations. In Eden, mankind is faced with two choices, both of which have their attractions: are Adam and Eve to continue their benign, robotic, (and largely meaningless) immortal existence, or are they to embark on a richer life of both joy and pain – one of mortal struggle, suffering and inevitable death, but also a life of procreativity with its consequent familial and cultural flourishing. 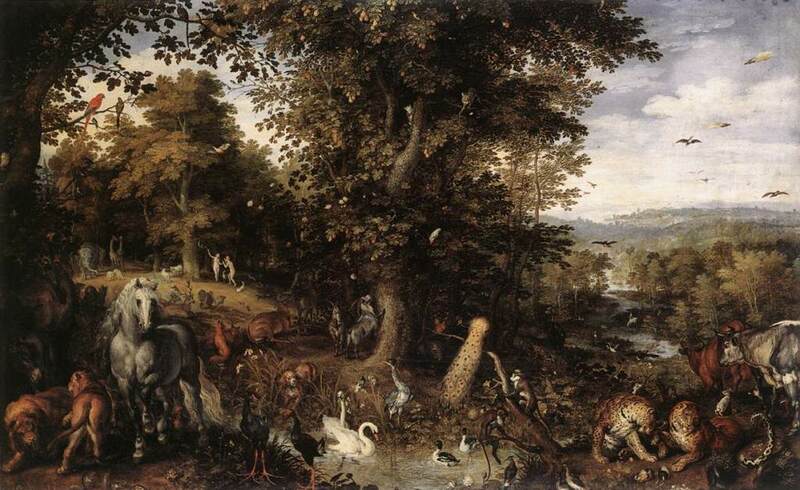 The Genesis author reveals through allegory that, in the absence of free will and conscious choice, the contemplation of desirable ends have no place in the utopian life of Eden. It is the existence of free will and the ability to apply reason to our choices that give life its richness. The garden story elevates a mundane existence to a life of choices and their consequences. At the end of the day, the author is making the theological claim that, by allowing mankind the freedom to choose, God surely desires the company and worship of free people, not the adulation of slaves. Alas, the story we read in any arbitrary English Bible is a story translated into a language qualitatively different from that of ancient Hebrew. Moreover, because these texts have been copied over and over down through the ages, its words have become riddled with scribal errors, mistranslations, and in some cases, willful misrepresentations. Fortunately, there has been a renaissance of sorts in the fields of biblical scholarship. Based on recent advances in technology, investigators have discovered a wealth of new material that eliminates much of the guesswork of the medieval exegesis that still plague many commercial translations. With today’s advances anthropology, textual analysis, linguistics, and archaeology, Bible scholarship has rejoined the ranks of serious academic pursuits. 15Then the LORD God took the man and put him into the garden of Eden to cultivate it and keep it. Huh? Hadn’t God already put the man in Eden (verse 8)? What’s going on here? The solution, as we will see, is literary in nature by which I mean that the author is using what modern scholarship has discovered is a conventional and quite common technique (resumption following a parenthetical clause) in biblical literary methods. I’ll discuss this, and other literary techniques, in the verse-by-verse commentary. These advances in biblical scholarship have reshaped the story of the Garden of Eden in a way that scholars now believe more faithfully reflects how the ancients would have understood it. Indeed, because of these advances, few scholars remain that still subscribe to the interpretation that the Eden story has anything to do with what has become known as “Original Sin”2)The concept of original sin was first alluded to in the 2nd century by Irenaeus, Bishop of Lyons in his controversy with certain dualist Gnostics. , as understood in later Christian doctrine. A current and arguably more widely accepted view is that the story imagines sin as entering the world when Adam and Eve are expelled from Eden. Understood this way, the act of eating the fruit of the Tree of Knowledge was not an act of disobedience whose punishment was to be banished from the Garden. Rather, they are banished from Eden because eating the fruit conferred on the primordial couple the ability to procreate (which they almost immediately did). As will become clear in the commentary, the ability to populate a confined space (an enclosed garden) with immortal beings required that they be expelled. In telling the story, the author constructs a beautiful story of mankind’s loss of innocence when he chooses to become sexually procreative. In creating this new translation of the Garden story I wanted to make sure that it reflected current biblical scholarship as best I could. The motivation for this approach lies in two observations: First, of the many commercial Bibles in circulation today, many (most?) were either written hundreds of years ago or are updated copies of these older Bibles. Second, commercial Bible companies are rightly conservative and reflect the buying preferences of their customers. Radical changes in the text, especially those which might change religious doctrine, tend not to be commercially appreciated. It ought not surprise us then, that the committees of scholars who write these Bibles and who are fully aware of the latest findings in biblical research (many of which I cite in this translation), choose instead to evolve the text. Put more simply, because radical change does not constitute a strategy for commercial success, most Bible publishers are inclined to produce Bibles whose text must walk a fine line between scholarship and customer expectations3)It’s quite common, actually, to find that a footnote in an older version of a given Bible becoming part of the text in a subsequent edition..
Because I am not bound by commercial considerations, I am free to express any arbitrary biblical text in ways I hope reflects these latest advances. However, the problem in developing such a translation is choosing the scholarship around which there is a basis for consensus and that are supported by recognized authorities. To this end, the citations I employ in developing this translation are from scholars whose results have been published in peer-reviewed, main-stream academic journals. 1. ↑ Even the verbs used are different. In the first creation story, the verb for divine creation, bara, is used to describe how God creates mankind (and selected other created things). In Genesis 2 the verb yitzar (meaning to shape, form, or sculpt) is used. Where bara is verb whose only subject is God, yitzar is a verb used by both God and His creations. 2. ↑ The concept of original sin was first alluded to in the 2nd century by Irenaeus, Bishop of Lyons in his controversy with certain dualist Gnostics. 3. ↑ It’s quite common, actually, to find that a footnote in an older version of a given Bible becoming part of the text in a subsequent edition.